South Africa’s energy planning revolves around two interrelated but separate processes, the Integrated Energy Plan (IEP) and the Integrated Resource Plan (IRP). The IEP covers all energy, including liquid fuels/transport and the IRP covers just electricity. Having failed to keep these plans properly updated as mandated, both the IEP and IRP are running in parallel. As one is supposed to feed into the other, this is probably not a good idea. Anyway, the department of energy has been running roadshows on draft plans and a recent update in parliament is that the department is now tabulating and responding to oral submissions and will release response reports by the end of March 2017. Further opportunities to provide input is scheduled to be completed in May or June with a final IEP and IRP being released in August or September. These documents will sketch out likely future scenarios which will inform what kind of investments need to be made over the next few years and decades. The energy system is huge and change happens at glacial speed. Small changes have tended to come from policy changes on a top-down basis. For a long time, this was the position of the telecommunications sector. But the introduction of the Internet protocol and cellphones upended everything. What is significant is that almost every innovation in telecoms over the last two decades has come from outside the industry and change has been driven in a bottom-up process. Regulators and state-owned incumbent operators have been forced to adapt to the immense changes that they had no part in bringing about. One energy scenario, which is unlikely to get much attention as it is still early days, is the impact of electricity storage. For now, batteries are a small detail in the electricity system. Almost all electricity storage today is in the form of pumped water storage such as the recently completed Ingula project. Things might change quite quickly. The price of lithium-ion batteries, using a set measure, has fallen by 70% since 2010 — from over US$1 000/kWh to around $350/kWh, but prices might drop to as low as $120 by 2030. The holy grail is to get prices below $100/kWh because then, storage starts to displace gas fired peakers that operate in times of peak demand. However, even before any of that happens, electric vehicles (EV) could have a profound effect on the whole energy system. The reason for this is that, purely on an energy consumption basis, cars are highly inefficient: a car is a lump of metal weighing a ton or more built to move, say, a 70kg human body (or a few of them) from A to B, but which can do so at high speeds (traffic permitting). Let’s then work out the existing EV value proposition because the basic building blocks, commercially available EVs, are already being sold. In South Africa, there are two pure EVs on sale: the Nissan Leaf and the BMW i3. 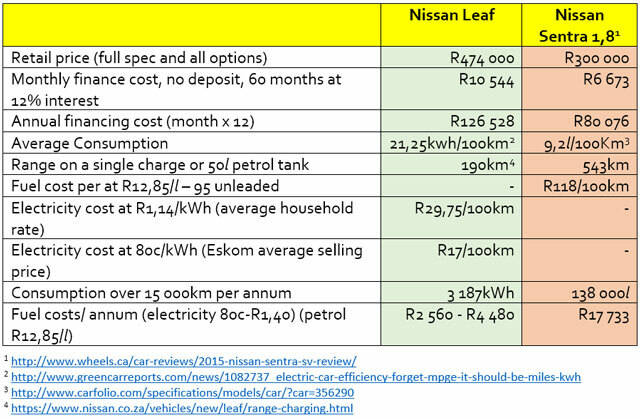 Against a R300 000 car, the Leaf is still more expensive to own, but not by a big distance. Further, fully a quarter of the cost of the Leaf is in the battery and batteries are falling in price quicker than expected. The environmental benefit of driving a Leaf over an internal combustion engine car is the matter of some debate. Looking only at CO2 emissions, the Leaf would be using electricity generated by Eskom and Eskom with its low-grade coal dependence, is one of the dirtiest utilities around. Eskom’s own figures say that emitted 223MT per annum to generate 226 300GWh or 0,98kg/kWh. Then there are transmission/distribution losses along the way of 8,8%, so the final figure at the socket would be 1,06kg of CO2 per kilowatt-hour. The Leaf would, on this basis, be responsible for 22,52kg of CO2 emissions per 100km. The rough equivalent for internal combustion engines is about 2,3kg per litre. The Nissan Sentra would be emitting 21,06kg of CO2 per annum. However, the CO2 calculation has a number of other variables. The mining of coal results in more CO2 but petrol has to be extracted in far-away places, it has to be transported, refined and then delivered to petrol stations and so on. In South Africa, a third of all petrol is derived from coal in a process that is also very CO2 intensive. Further, as we now know, Eskom has surplus generating capacity and therefore operates sub-optimally. Additional generation to charge EVs would likely reduce the CO2/kWh that Eskom generates. The increasing contribution of renewables in the mix will also see the CO2 emissions per kWh generated decline. Obviously, just a few EVs means little. But that could change quickly. Norway, which provides various subsidies and incentives for EVs, is now seeing full EVs and plug-in hybrids representing 37% of all new car sales. It is worth remembering that South Africa once underwent a big energy transition of sorts. Two apartheid era behemoths are the result of this transition. Sasol was formed in the 1950s using the Fischer-Tropsch process developed in Nazi Germany to convert coal into liquid fuels to reduce dependence on oil imports from an increasingly hostile world. 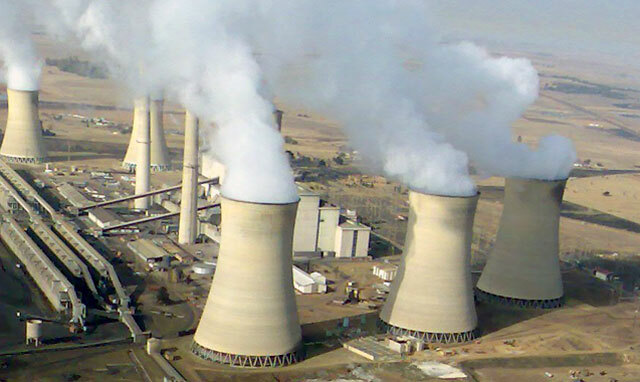 Eskom’s massive power station build was also partially directed at converting all industrial processes that had used oil to electricity generated from coal mined from within the borders. According to e-Natis, the South African car population is 7 010 757 cars (65% of all vehicles) and 2 440 998 bakkies (22,6% of all vehicles). Naamsa, the vehicle industry body, says that between 35 000 and 43 000 cars are sold per month (say an average 39 000) and between 12 000 and 17 000 bakkies are sold per month (say an average 14 500). In a year, about 642 000 vehicles are sold. If we could get to where Norway is now and EV sales reached 30% of the total or just under 200 000 EVs per annum, then at the end of five years, there would be a million of them on our roads. This is where things become interesting: using the Nissan Leaf figures again, if a million EVs each use 3,2MWh/annum, then all of them together would be using 3,2TWh. This is significantly less than Eskom’s current surplus capacity, which could probably generate about 10TWh more per annum. Still, if EV drivers are paying Eskom 80c/kWh, Eskom will make more than R2,5bn/year more than it otherwise would do. There would be another benefit. Fuel savings (using the Nissan Sentra again and assuming 15 000km/year) would be 1,38bn litres (one million x 9,2l/100km (0,092l/km) x 15 000km) or more than 10% of the 11,34bn litres of oil-based fuel that South Africa consumes every year. South Africa imports 21,3m metric tons of oil (or 156m barrels) per annum. A 1,38bn litres no longer required equates to 8,7m barrels of oil. At US$50/barrel, our forex savings would be $434m/year and at a R13,50/$ exchange rate would amount to almost R5,9bn. If other countries did this as well, the global oil market could not sustain itself. This would present some problems for national treasury though. Government taxes petrol at about R2,85/l so this would reduce the tax take by about R3,9bn/year. The potential benefits don’t end there. A new Nissan Leaf battery can supply 90kW of power instantly and store 30kWh. If a million EVs could be connected to the grid in some way, EV owners could sell grid management services to the grid. If all EVs were charged in off-peak times (in the middle of the night), there would be significant unused storage capacity waiting to be employed. Connecting EVs to the local grid would assist with peak shaving, load-shedding or frequency support. For this service, EV owners could be compensated. Once again, and in theory, a third of a million EVs configured in this was could provide 30GW of instantaneous power, which is just less than Eskom’s total capacity at any one time. Ingula, built at R36bn, can run all its generators to produce 1,3GW and can do so for about eight hours on weekdays (generating 10,7GWh/week). This capacity could be mirrored by 350 000 EVs connected to a smart grid. In the absence of a smart grid, EVs discharging power during peak times might be used to support huge investments in variable renewables. Of course, much of this appears to be far-fetched. It is not going to be part of any IEP and IRP scenarios processes. But it is also not pure fantasy because it does not require future technologies and the financial assumptions are not based on unrealistic future projections. There is another reason to give it another thought. It does not require too much top-down planning which is a feature of much of the electricity or energy systems anywhere. As EVs start to make sense on a pure financial basis, decisions to buy them are made by individuals deciding what is best for them. The potential benefits to society, the economy and the environment are mere by-products. Change is therefore bottom-up and that must be a more robust starting assumption than many other ideas about the transitions that will take place in our energy systems. Great article. As you point out, once EV’s are cheap enough it’s going to be obvious to everyone that they can buy one and make a real saving on fuel costs. 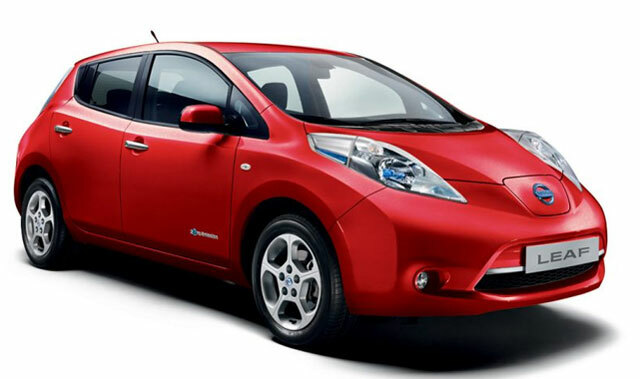 I checked in 2016 and Nissan confirmed to me that in Cape Town there were still no charging stations, nor could they service a Leaf in Cape Town. Not much incentive yet to go EV in SA. How long can you drive with the first battery pack ? What does it cost to replace it on the Leaf ? Does an electric engine need maintenance ? When we would have private energy companies, we surely would be able to get discounted rates for off peak hours. Eskom is the real issue. And we have a state monopoly because of the present Gov, so we really need regime change in 2019. I tend to think that initial buyers of electric vehicles (EV’s) will also be self generators in terms of electricity, especially as EV’s are premium priced currently. Solar PV and EV ownership will go hand in hand at least until it reaches mass market consumption levels. For the average car owner in that category, that will mean zero electricity costs. Charge once a week at home during the weekend. Recent model EV Cars typically have 300km+ range (ignoring the underpowered i3 with half that). 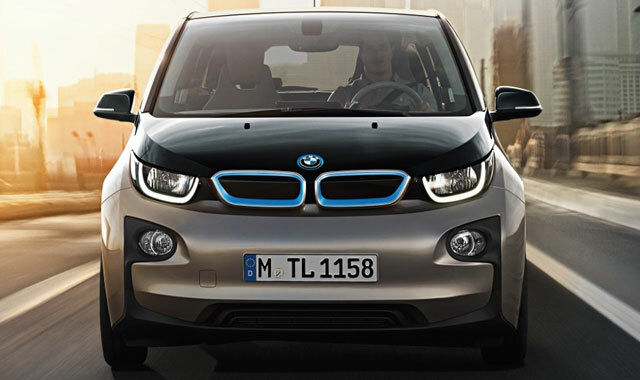 BMW i3 – 180km range, $42,000 and up. In 5 years those prices will drop at least 10,000$ as battery costs drop (they’ve dropped substantially year on year, and are on target to continue doing so), so will compete with ICE vehicles in an increasing share of the market. Less moving parts in an EV – so reliability will be higher. Less running costs – so cheaper to own. Final barrier to market share – high price, is starting to be breached. Issues are that the government will no longer make money hand over fist on petrol. Eskom won’t necessarily make money selling electricity, so thats less taxes (and thats their own fault, as they’re fighting a losing battle against solar). Something will have to give. Expect lots of propaganda against EV’s, and more taxes in the near future..
Not one mention of charging an EV using residential solar?! The author undoubtebly is aware that, like lithium batteries, solar pv panels are also dramatically falling in price. The reduction in CO2 emissions by charging with CO2-free solar energy is a no-brainer.